Aliseo is great because it has tons of space, privacy, and easy access to the beach, shops, and restaurants. You can be pampered and entertained thanks to the full staff, home theater, game room, and a gym. At Aliseo, you also have access to the Sandy Lane beach facility where you can swim, snorkel, sunbathe, and gaze out to sea. Private with a 5 minute drive to Sandy Lane beach! 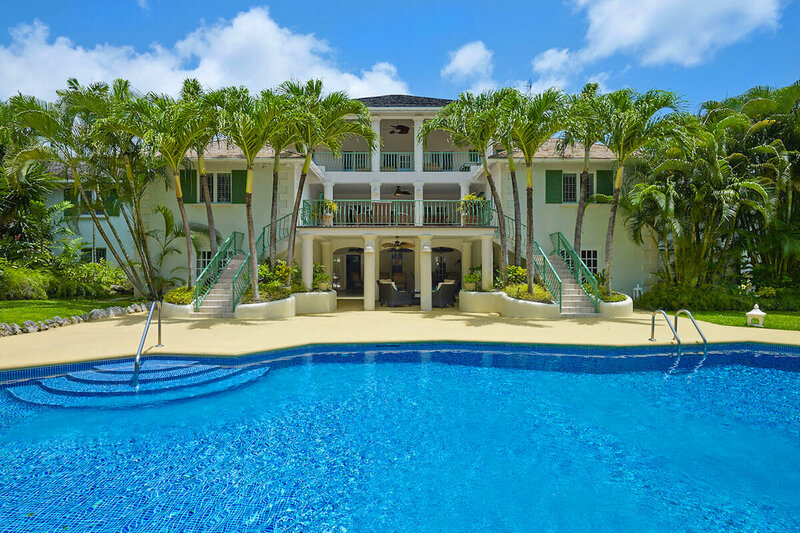 Aliseo Villa is a classic, antebellum-style home near Colony Club and Sandy Lane Beach. With two, fully air-conditioned levels and nine ensuite bedrooms, this villa is perfect for family vacations and couples’ getaways. This property has all the amenities of a boutique hotel. Aliseo is fully staffed with a daily chef, housekeeper, security guard, and butler; as well as a gardener and a manager. Guests also have access to Sandy Lane’s beach facility, sun beds, and umbrellas. At the villa, a gorgeous stone terrace wraps around the expansive pool and hot tub. Palm trees, manicured hedges, and lush lawns surround the terrace and add plenty of shade. There’s lounging space around the terrace, but the garden gazebo is perfect for more privacy. Pull the curtains and turn on the fan to relax in peace, or take in the pool and garden view. The veranda off the pool deck is set up for banquet-style dining, with ceiling fans and garden views. There’s more lounging and dining space on the mid-level balcony. Aliseo’s lower level is packed with activity. The entertainment room has a karaoke machine, a jukebox, and an adjacent kitchen, and opens straight up to the terrace and garden. The media room rivals a full theater, with movie posters around the walls and a wide projector screen directly opposite a plush leather recliner couch. There’s also a game room with a pool/casino table and ping pong, and a gym with resistance machines, cardio equipment, and a flatscreen TV. All four suites on the lower level have king beds, ensuite bathrooms, and flatscreen TVs. The Garden Suite has its own private patio that opens to the swimming pool. The upper level holds four more king suites, and all have views of the manicured gardens. Every bedroom has an ensuite bathroom, walk-in closet, and a flatscreen TV. The Bajan Suite is the master bedroom, and it has its own private balcony on the third level. The Ocean Suite and Monkey Suite are both equipped with two twin beds that can be made up as a king, and would be ideal for children or couples. Aliseo guests have access to Sandy Lane Hotel’s award-winning golf course, restaurants, and spa by reservation. The hotel and its namesake beach is a short drive away, and Colony Club is also nearby. The villa is open to weddings and special events as well. 5 minute drive to Sandy Lane beach! Access to the Sandy Lane Property Owners beach facility at the nearby Sandy Lane beach.